• This is not a new, or amended Rule of Golf. • It is the recommended wording for a Local Rule that may (should!) be introduced on or after 1st January 2017. • Committees will have to introduce the Local Rule for it to take effect on 1st Janaury 2017 and they are encouraged to do so. • It only applies to a ball, or ball marker, at rest on the putting green being played, not anywhere else on the course. • It does not matter how the ball or ball-marker was accidentally moved, e.g. with the head of a putter, kicked, or as a result of a glove being dropped on it. • It only applies when a ball or ball-marker is accidentally moved; it does not apply to a ball that is purposely touched or moved, e.g. a ball that is lifted without being marked. • It applies to the player, their partner, their opponent(s), or any of their caddies or equipment. • The ball or ball-marker that was accidentally moved must be replaced, as provided in Rules 18-2, 18-3 and 20-1. • If a player does not think that they caused their ball to move in any way they must play it from where it came to rest, e.g. if it was moved by wind, water or gravity. • The ruling that Dustin Johnson had caused his ball to move at the 2016 US Open. Click here for details. • Ian Poulter dropping his ball on his ball-marker at the Dubai Championship in 2010. Click here for details. • Mike Clayton accidentally knocking his putter into his ball as he tried to catch it after throwing it in the air. Click here for details. I certainly welcome this move by the Ruling Bodies, as the first step in their 'Rules Modernisation', which apparently is well under way and about which we will hear much more during 2017. There have been numerous instances where players have incurred penalties when their ball has moved, sometimes imperceptibly, on the much faster, undulating surfaces of putting greens. The only question that now has to be asked when this occurs is whether some person accidentally caused the ball to move, in which case it must be replaced, or whether something else caused it to move, e.g. wind or gravity, in which case it must be played from where it came to rest. The press seem to think the new ruling would have solved the Dustin Johnson issue, but surely it would not have. He did not think he had caused the ball to move and played it as it lay. The officials (belatedly) considered he had caused the ball to move and was penalised 1 shot (rule 18.2) and should have replaced the ball but was not penalsed for that. Now, or rather, after Jan 1st he would have been penalised too - for not replacing the ball. D20-1/15 will also be overridden in the presence of the new local rule. I don't think they need to be withdrawn. They need to be Revised to clarify they will not be in application in case the Local Rule is in use, but not taken out of the book. 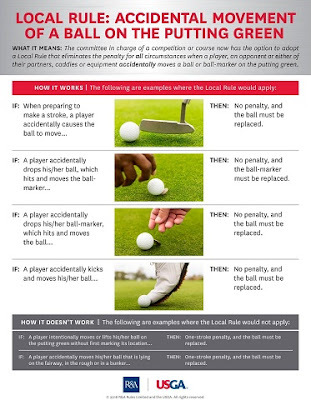 It could happen that the Local rule is not in application, as the embedded ball relief through the green Local Rule is not applied at the R&A events. I take your point, but in the case of the new Local Rule, all Committees are being encouraged to introduce it immediately, which is different from the embedded ball through the green Local Rule, where the USGA and R&A are not in total agreement, leading to its almost total adoption in USA and Mexico, but not in the rest of the world. In any case, in my opinion, there is unlikely to be a new Decisions book before the next amendments to the Rules of Golf, but I may be wrong! Would the new Local Rule overide Decision 23-1/11. Ball Moved Accidentally by Foot During Removal of Loose Impediment on Putting Green. A penalty is incurred if you accidentally kick your ball whilst removing a loose impediment on the putting green. As of the introduction of the Local Rule no penalty is now incurred. Would that be the correct interpretation. Correct. The Local Rule means that there is no penalty when a player accidentally moves their ball on the putting green. Just getting my head around the potential new local rule. Considering the two statements from the R&A it makes sense until a ball just touching the putting green is marked with a marker off the green. If the ball was lifted and such a marker was accidentally moved would this local rule apply? I suppose my question boils down to whether a ball is regarded as lying on the green when it has been lifted for the purpose of any rule. "When a player’s ball lies on the putting green, there is no penalty if the ball or ball-marker is accidentally moved by the player..."
There is no reference to the location of the ball-marker when it is moved, it is only the location of where the ball was marked that is relevant.